Cara Burrows packs her bags and runs away o a five star resort in Arizona. She is upset with her family, her husband and her two children Oli and Jess. Cara is pregnant but her family is against a new baby, but nobody asked what she really wants. So she books herself into a luxurious hotel in Arizona to put some distance between her and her family and to have some thinking time. When she arrives at the hotel the receptionist hands her the wrong room key, which kicks off a whole series of events. Let’s just say Cara’s break is not like she expected it to go. 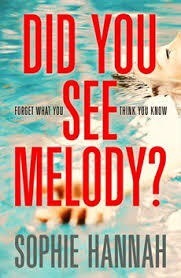 Cara uncovers the mystery about the missing Melody Chappa. The book is great. It is fast paced and a real page turner. I love the way the author has set the scene in this five star luxury holiday resort. It sounds great, like I wanted to be there as well. The book is full of twists and turns right to the last sentence even. Very unexpected outcome. Highly recommended.